Ph.D. Research Scholar Ms. Neelam Sharma and M.Pharm. 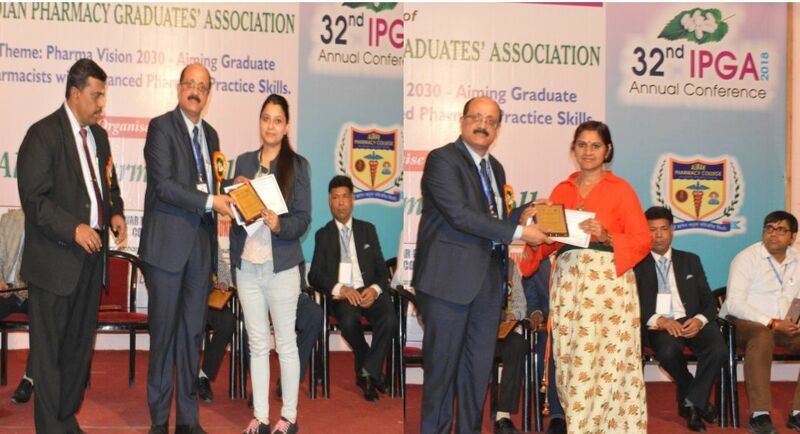 Student Ms. Navni Sharma of ASBASJSM College of Pharmacy BELA, won first and second prizes for scientific poster presentation held as a part of the 32nd Indian Pharmacy Graduate’s Association Annual Conference at Alwar College of Pharmacy, Alwar Rajasthan held on 24th February, 2018. Both student present their own research work in well and expounded scientific manner. The Managing Committee and Director of institute Prof. Shailesh Sharma congratulate both the students for this great achievement and laurels to the institute. .The theme of the conference was Pharma Vision 2030: Aiming Graduate Pharmacist with Enhanced Pharmacy Practice Skills. Around 15 students and three faculty members of COP-Bela participated in the annual conference.